Looking for a cute baby shower ideas and theme?! Look no more, I’ve got you covered! I recently threw a Rubber Ducky themed Baby Shower for my sister. My sister is due any day now with twin boys and it was so much fun sprinkling her with little duckies! When planning a shower, it is important to focus in on a few main details: The food & drink display, the dessert table, decorations & games/activities. The key to a great shower is all in the little details. I love sprinkling the shower with little sweet features throughout every aspect. 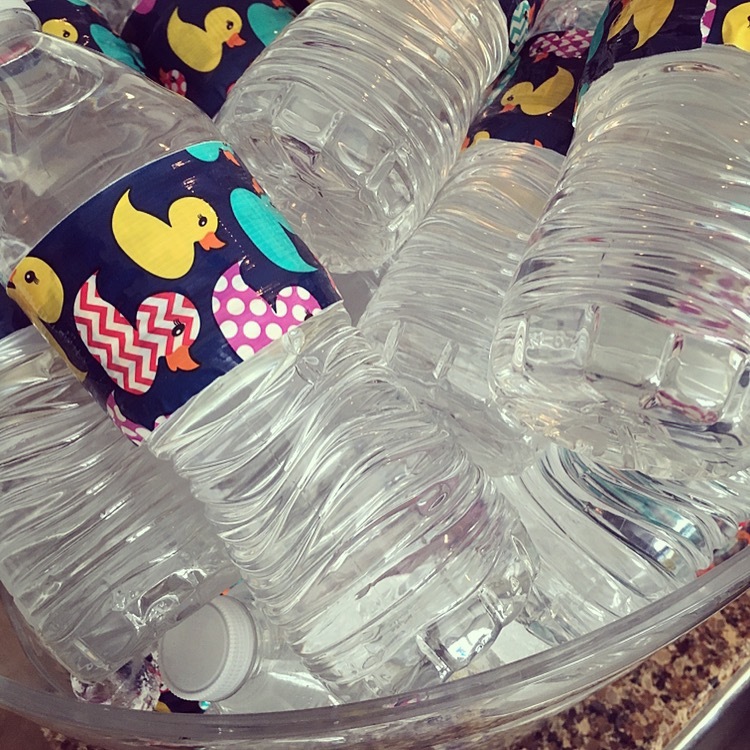 In my Baby Shower Series, I will be touching on a few of my favorite details from my recent Rubber Ducky themed Baby Shower, as well as a few how-to tutorials so that you, too, can make these items for your next shower. 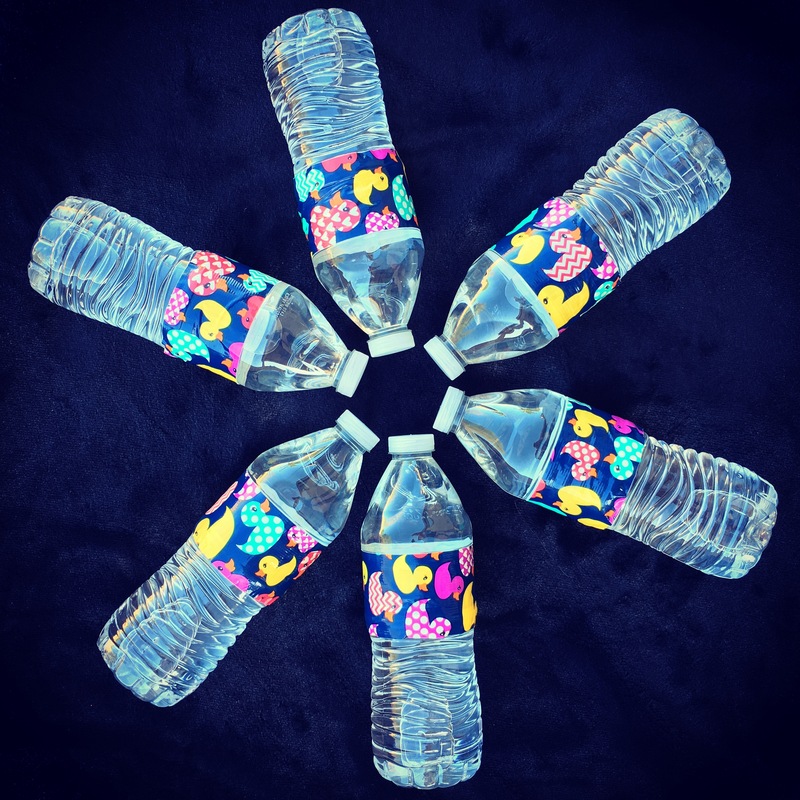 Today’s post is showing you how easy it is to turn your boring water bottles into a refreshing focal point. I like to keep things simple, so I decided to bypass cups and ice for this baby shower, and instead I decided to serve individual chilled drinks. 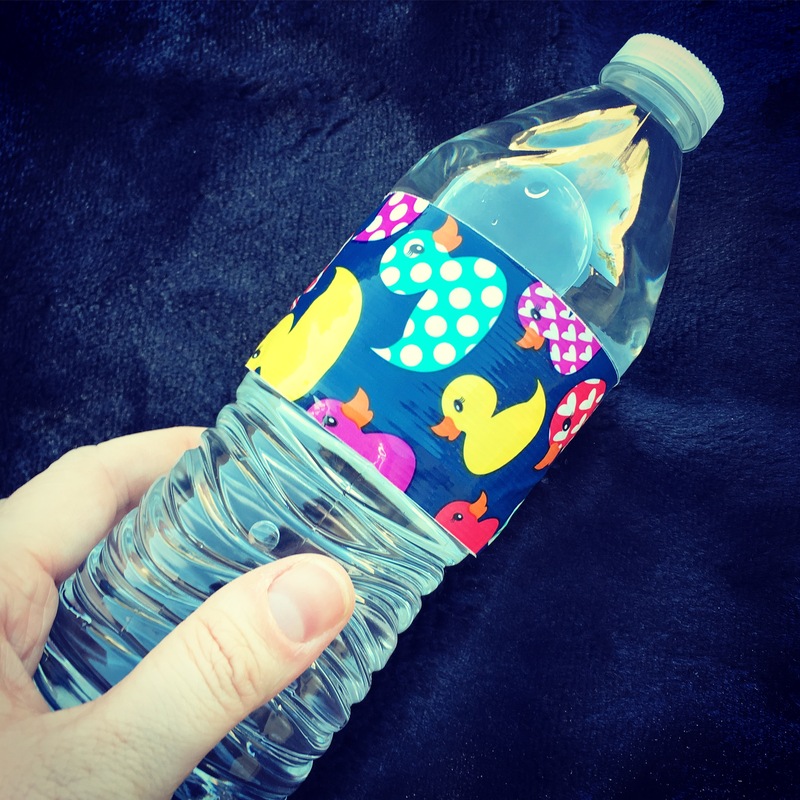 Here is a cute way to dress-up the typical, boring, water bottle look. 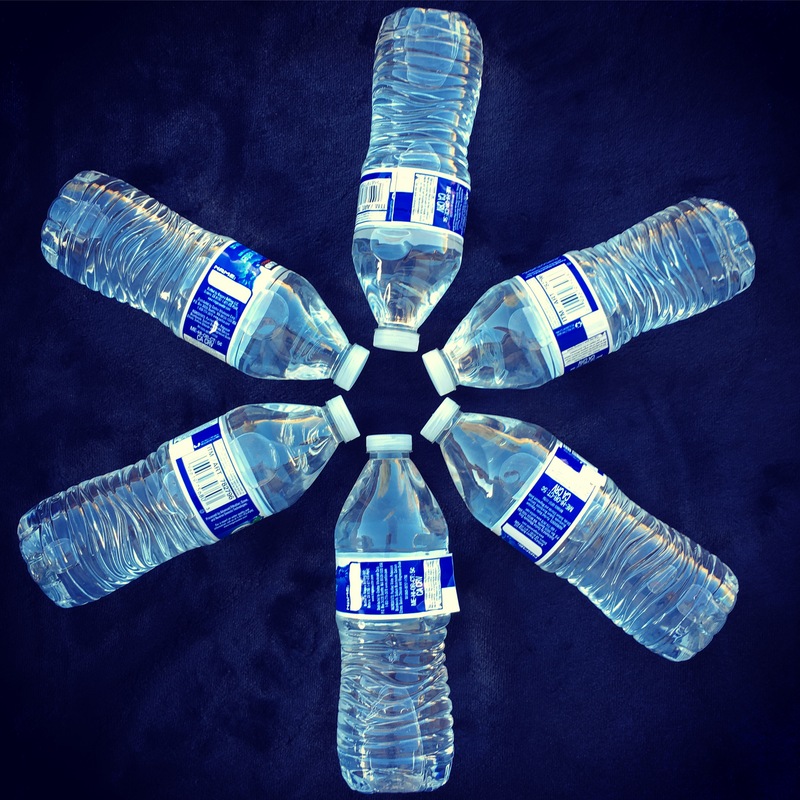 Purchase a large case of water-bottles. I decided to buy the Costco 40 bottle pack, I found it to be the best bang for my buck! 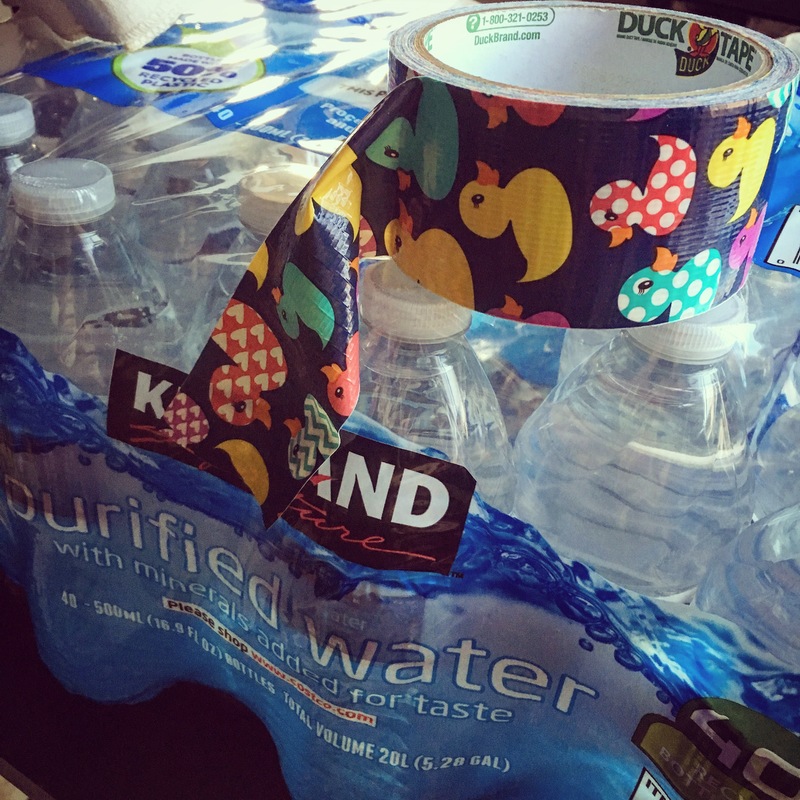 When I found an adorable rubber ducky themed roll of Duck Tape I just about fell over in excitement – too perfect! There are so many designs and colors to choose from, you are sure to find one to match any theme. 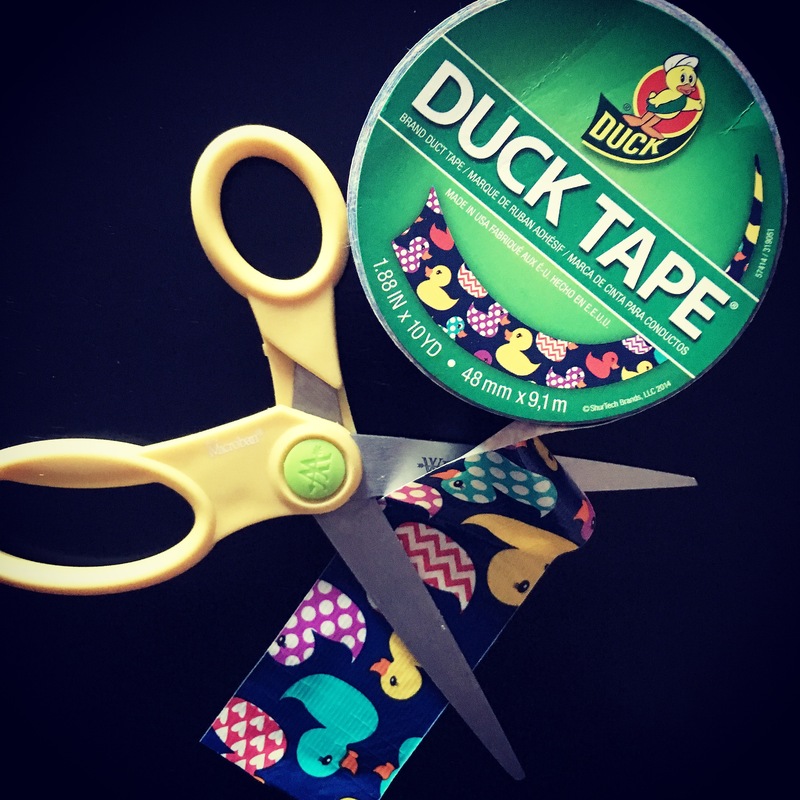 Click HERE for tape options. You will also need a ruler and a pair of scissors. 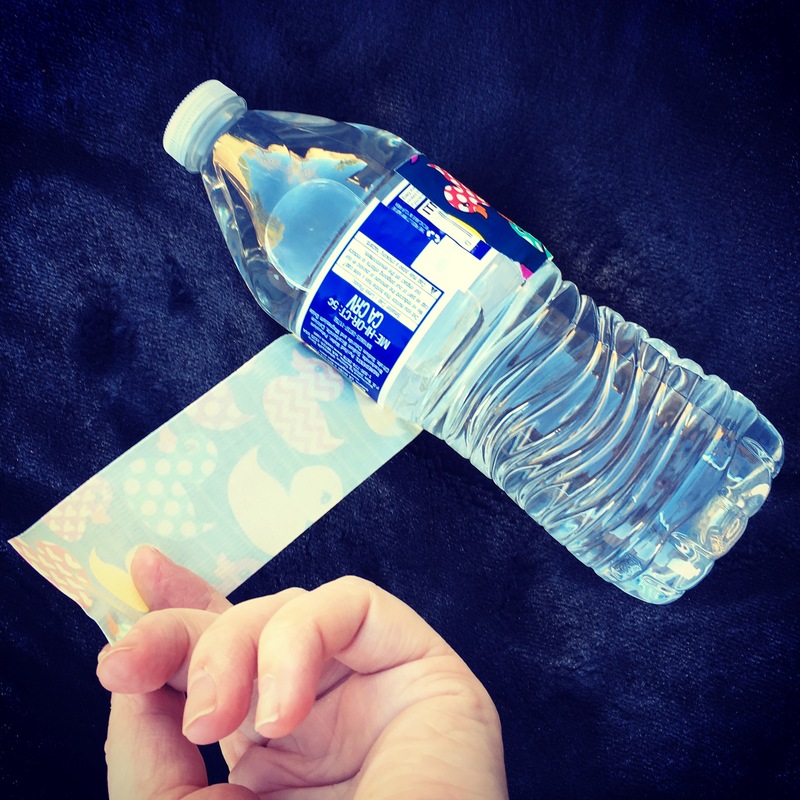 The roll of tape will equally cover your full pack of 40 water-bottles if you measure out each piece of tape to approximately 9 inches. 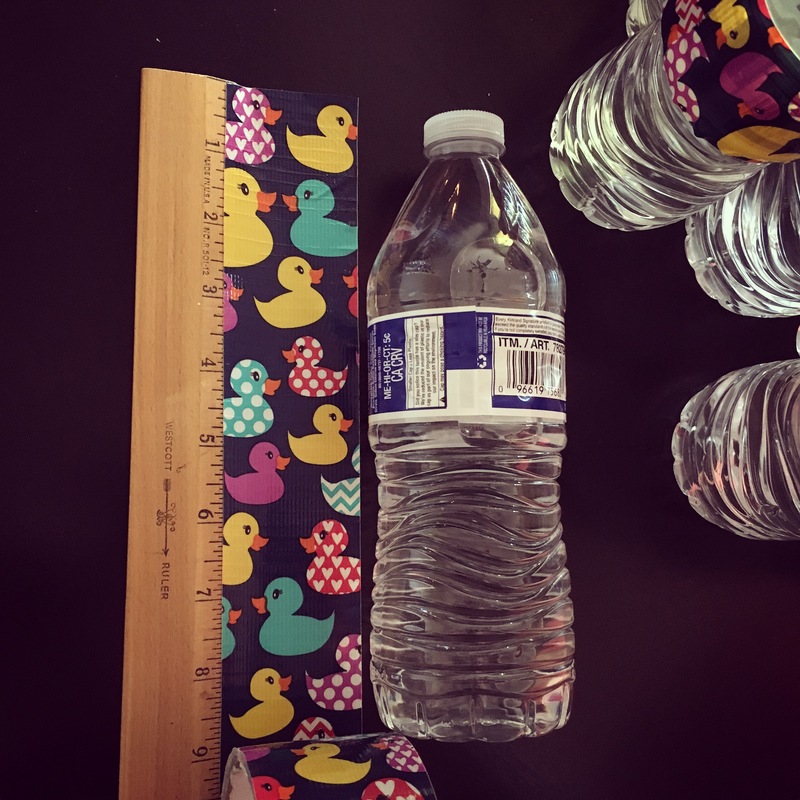 If you don’t have a ruler, just measure the piece of tape against the length of the water bottle. 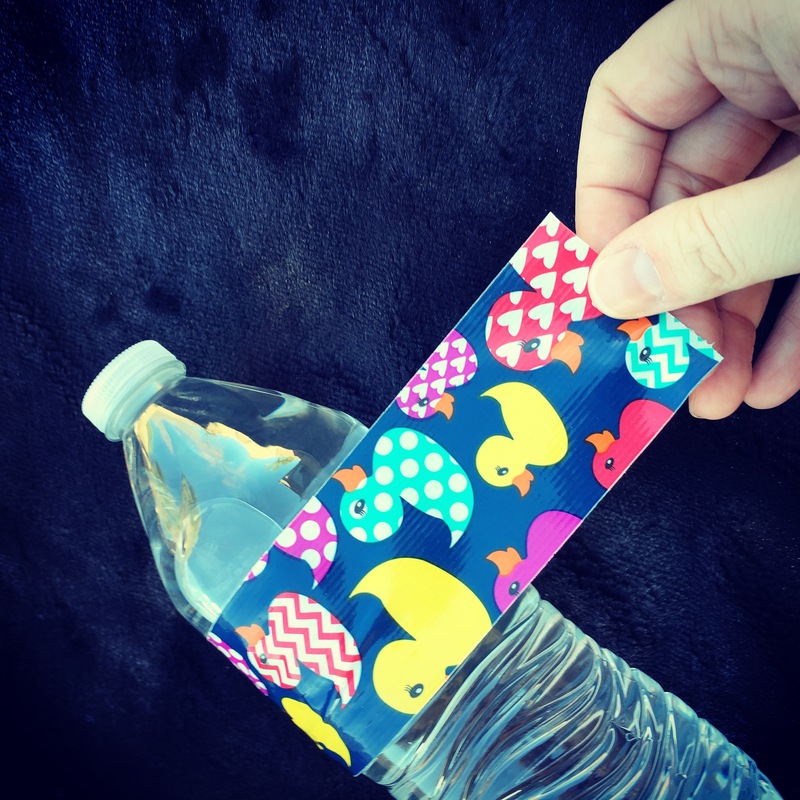 Once you have your piece of tape ready, wrap it around the bottle covering up the water-bottle label. The dark design of this tape completely covered the label perfectly, and eliminated the step of cutting off the previous label! Win-Win! Also, I found that keeping the original label on the bottle, made it easier to follow where to place the tape. There you have it. Yes, it is that simple! Don’t forget to stay tuned for my next baby shower idea, you will not want to miss it! Super cute AND easy! I love it! YES, and thank you for stopping by Espresso Ever After!